Do you have a dog that you can't walk down the street? Does your dog bark, lunge, or growl at other dogs? For more than 15 years, All About Dogs has offered our Relaxing Rowdy Rovers program to help these special-needs dogs learn new coping skills. We'd love to help you too. Rowdy Rovers is a special group class designed especially for dogs who are reactive toward other dogs. We offer it in our Woodbridge location on Thursday nights year round with rolling enrollment, so the classes always have a mix of beginner and advanced dogs. 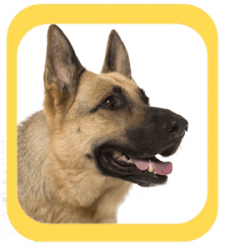 This provides your dog a chance to practice new social skills in a safe, controlled environment. You'll be surrounded by people who share the same challenges with their dogs, so there's never any judgment when a dog has a particularly barky night. Over time, many of our Rowdy Rovers develop strong enough skills to participate in our regular levels classes at no extra cost. Q: Sounds good. How do I join? A: Send us an email to tell us all about your dog (i.e., what concerns you have, what personality traits you like, what your goals are). We want to be sure that Relaxing Rowdy Rovers will be a good learning environment for your dog before you join. If it sounds like Relaxing Rowdy Rovers will be a good fit, we'll email you the link to register. Q: Can I start right away? A: Because Relaxing Rowdy Rovers is a unique program for dogs with special needs, we sometimes have a waiting list. Q: What if you say Relaxing Rowdy Rovers isn't right for my dog? Some dogs will be too stressed by a group class environment, so we'll recommend private lessons for them. Some dogs, quite frankly, aren't rowdy enough for Relaxing Rowdy Rovers! In that case, we'll encourage you to join our levels program or one of our classes in Springfield, Falls Church, or Annandale. But if you are thinking Relaxing Rowdy Rovers is right for your dog, odds are that it will be a good fit but in some cases we may suggest starting with private lessons before joining. Our trainers love the Relaxing Rowdy Rovers clients--both human and canine. We look forward to working with you and your dog.